With the new season, comes new festivities, warmth, people out and about at Shelby Farms, brunch or beers on the patio, and also new seasonal food. One of those foods I particularly enjoy in season is asparagus. Asparagus is often seen as a boring but necessary meal prep vegetable that hits your nose when you go to the restroom, but it does carry its own dynamic of flavor when provided the right ingredients and love. A simple spring recipe I make often with it is an asparagus and tomato salad. 1. Heat the oven to 350. Place the cherry tomatoes and garlic in a bowl. Mix the olive oil and balsamic vinegar, and pour over the tomatoes. Season with salt and pepper, and set aside while you cook the asparagus. 2. 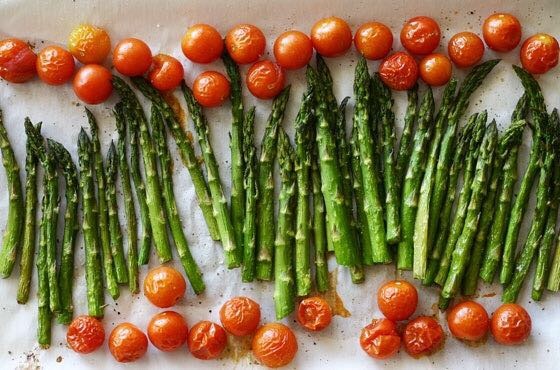 Brush the asparagus with olive oil and place in a single layer in a roasting tray. Roast for 15 mins, or until coloured and tender. 3. Place the asparagus on a platter and top with the tomatoes, pouring over some of the vinaigrette and juices. Break the bocconcini into pieces and scatter over the asparagus, followed by the basil leaves and then serve. Learn more about Nutrition Services from NBS.